On October 11th, 2018, Ambassador He Xiangdong met with Hon. Stephen Wani Michael, Mayor of Juba City Council. The Mayor briefed Ambassador on his visit to Chengdu City, Sichuan Province and Dezhou City, Shangdong Province in China and commended the Chinese Embassy in facilitating this visit. The mayor said that through the visit, he witnessed China’s remarkable development achievements. Juba City is eager to learn from the successful experience of China’s city development and construction. Juba City Council will continue to improve its investment environment in order to attract more Chinese investors. Ambassador He congratulated the Mayor on his successful visit to China. 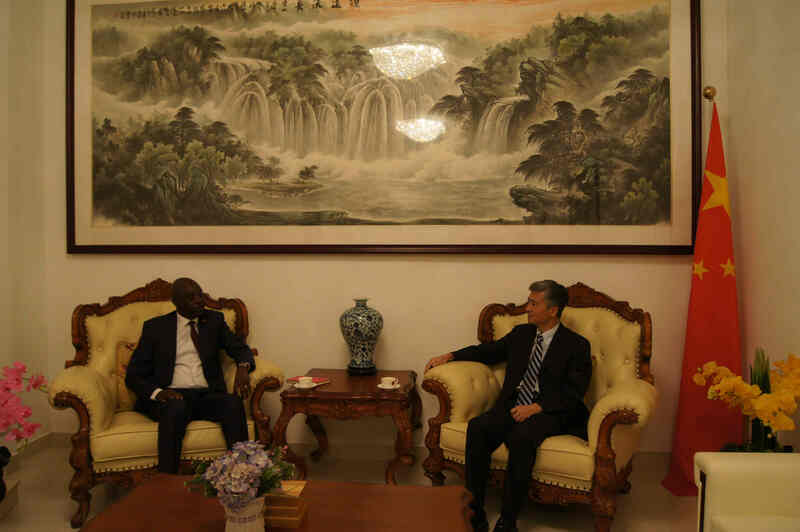 He said that local government exchanges are an important part of China-South Sudan relations. Many Chinese companies and investors have invested in Juba and made their contributions to the development of Juba. The Ambassador hopes that Juba City Council will take effective measures to ensure the safety of lives and property of Chinese citizens in Juba. Ambassador He also briefed the Mayor the experience of Chinese local government in attracting investment and improving the investment environment.